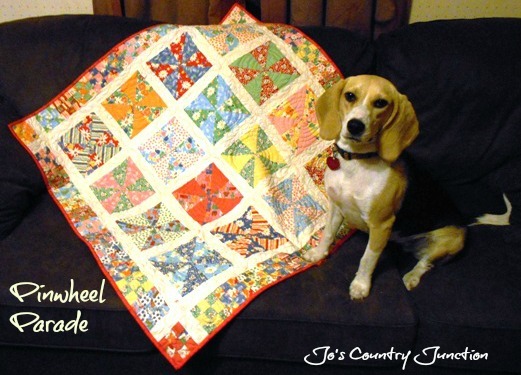 Friday Finish: Pinwheel Parade-Free Pattern TOO!! 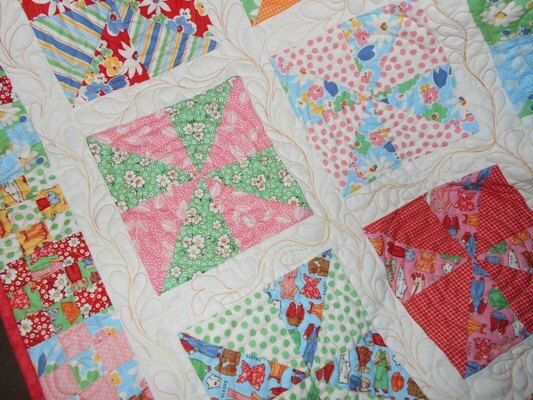 Today we have a treat for you…a new free pattern to make this cute little baby quilt. Here’s Ruby showing off the quilt we’re calling Pinwheel Parade. This was designed and made by Kelli…I wrote the pattern and instructions. It was made with two charm packs but could easily be made with scraps from your stash. 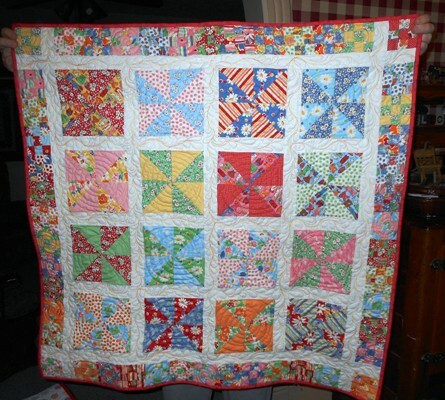 The quilts consists of 16 pinwheel blocks with nine patch blocks for the border. We used an older American Jane for Moda line called Snippets but there is a new line called Ducks in a Row that will be coming out in April that would be equally cute. I completely played around with the quilting on this. I used a variegated orange thread that I loved on it. I did some small feathers in the sashing. On the actually blocks I did radiating circles. It didn’t turn out too bad at all. I gotta say when making a baby quilt, I don’t think American Jane fabrics can be beat. They are kiddish but not the pastels…in my opinion perfect! Plus..anything with the color red is always appealing to me. If you get one made, we’d love to see it-so mail us a picture! !